I’m a big fan of abstract art, and I’m trying to incorporate more into our home, but it can be hard deciding what to go with. 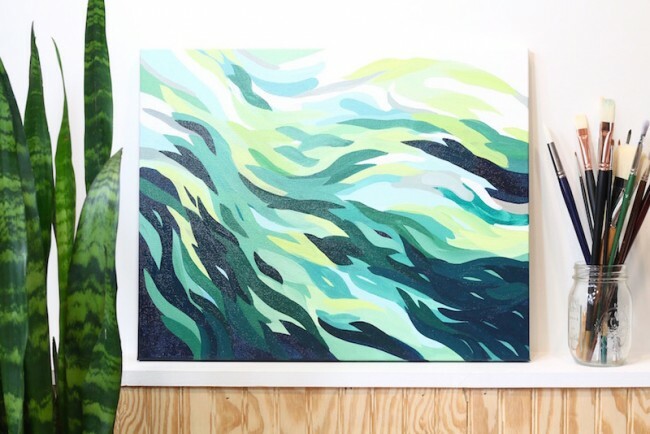 So I asked my talented friend Michelle from The Art Of Michelle (she painted our custom house portrait and my 4th wedding anniversary present) to stop by and share some tips on how to choose abstract art for your home. Take it away, Michelle! Buying abstract art can be intimidating. If I’m being completely honest, creating abstract art can be intimidating! I had always considered my illustrations to be more realistic with a dash of imagination (here are some examples). Delving into abstract painting seemed way over my head. That is, until I had my daughter. Something clicked with me when Josie was born this past January, as if a part of me lay dormant and was now awake, eyes wide open, taking in this beautiful and strange world. When she was born I think my heart nearly exploded. I started having all these feelings… so many feelings! I was bursting and needed an outlet. But I needed more than an outlet for expression. I needed time during the day to just be still, present, and connected with myself and my work. I needed an escape- just for a while- from the demanding daily obligations that come along with motherhood. So I pushed past that awkward feeling of intimidation and told myself “there are no rules here” and to “paint how you feel today.” I did. 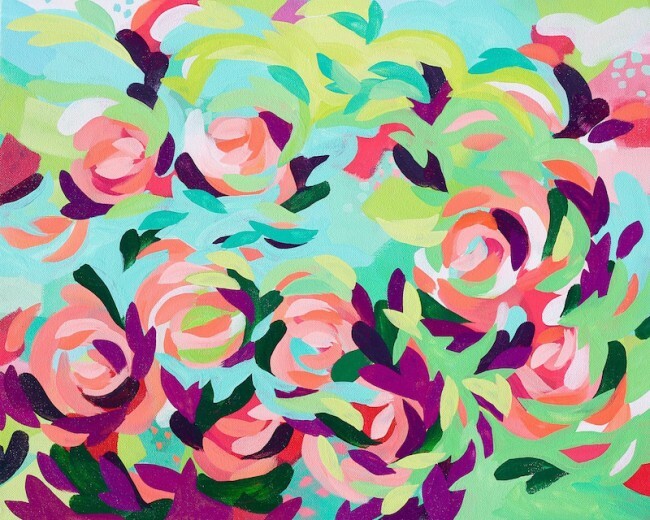 It was hard and brought up even more insecurities and feelings, but in the end, painting my Modern Abstract Florals has brought me immense happiness! I want you to buy art for your home infuses your life with that same sort of happiness. Here’s how to choose the best pieces for your unique taste. It’s quite simple! Just stop for a moment and listen to your feelings as you look at the colors and textures in front of you. What’s your internal dialog? Do these colors make you feel happy, excited, joyful? Or do you feel slightly annoyed, critical, negative? What feelings do you want to have right now? Whatever you feel in the moment of looking at that painting is most likely the emotion that painting will bring into your home. So choose carefully because you’ll most likely encounter negativity or happiness every time you walk past it in your house! Choose happiness! I used to think abstract artists had this secret that I wasn’t a part of. 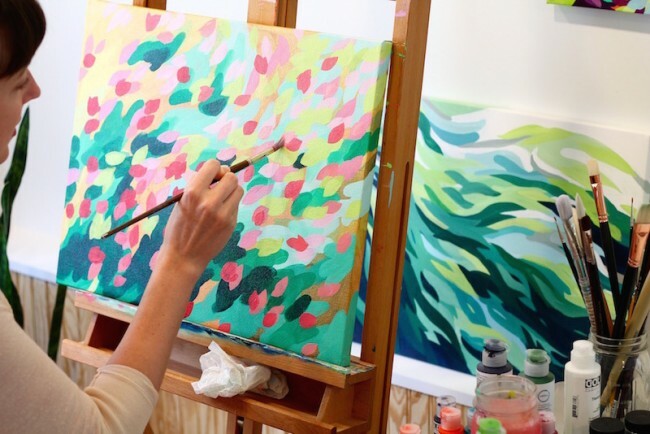 I’d think, “I’m not sure I get this.” But here’s what I’ve learned as a new abstract artist myself: there is no secret. We paint what makes us happy as a way of expressing who we are, what we love about this world, what we want to tell you. If you don’t connect with a certain artist, no worries! Find an artist you do connect with and know that that connection is the secret ingredient. Be confident in your taste. 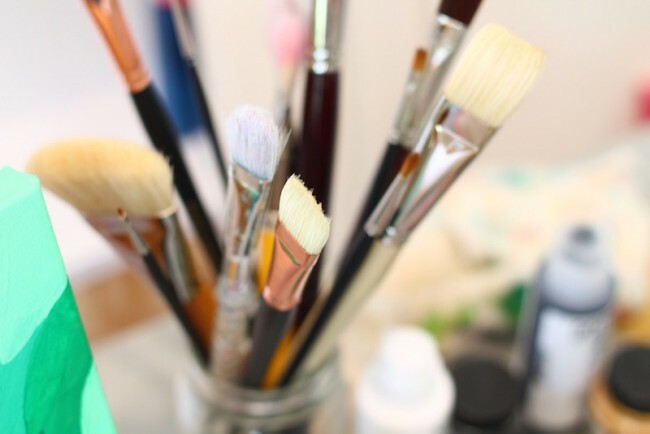 The artist is merely presenting you with options. You hold the power of choosing. Once you find that one abstract painting (or 2 or 3!) that makes your heart skip a beat and brings a smile to your face, talk about it with your friends and family. Tell them why you love it so much and see if they feel the same way! I have found that the best thing about art is being able to share it with others. No joke. I get a little giddy inside every time a customer tells me how much they connect with my work because it means they are connecting with me. And I’m genuinely curious what my husband thinks of some of the artwork I bring into our home. We have very different, dare I say opposite, tastes so the conversations are always lively! Thanks so much for sharing your tips, Michelle! michelle you are so talented!! I love that floral piece! Thanks so much for sharing my work! Your paintings are BEAUTIFUL! I appreciate your comments on how abstract art doesn’t have to be so complex that you don’t get it, it can just be something simple or that evokes emotions. 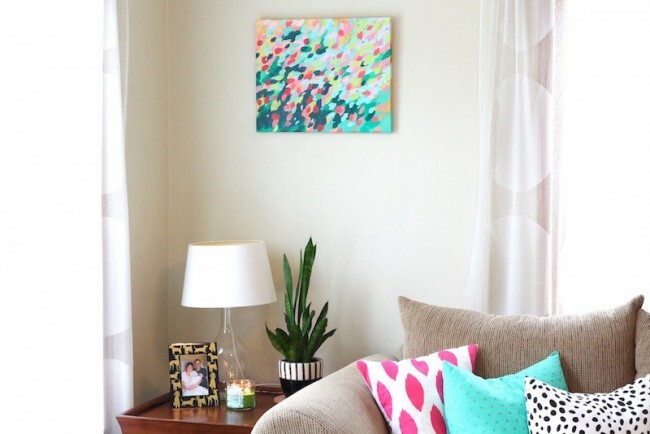 My husband and I are trying to redecorate our home and want to use some more modern art in my home, I love having fun pops of colors to add some happiness to each room. I will have to look into what art is available in my area. Thanks for your advice on choosing art! 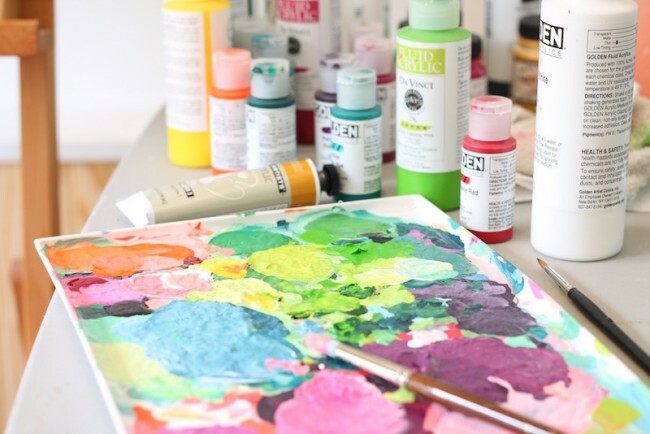 If you’re an artist and you have a good eye for color, it’s possible to create your own art piece to hang up on the wall! Even if the end result is something abstract, at least you can tell anyone who comes by your place that you made the painting yourself and you’re proud of it. If I had the artistic talent to even paint I would definitely try that, seeing as I like a splash of color here and there around the living room walls.